I am experimenting with different styles and flows trying to figure out what works so it will be a little bit before I get a regular video upload schedule. But until then check out my new channel and the work I have been doing. Subscribe today and keep up to date on new videos and projects! Thanks to a friend this past summer I became the owner of a broken Lute left by a rubbish bin in an alley. It was in sad shape with broken and missing frets warped and damaged wood it had seen better days. I didn't know what to do with it but this past week I got an idea to goth it out. I started with striping it down to basics and repairing the damaged wood cutting, replacing, and reshaping its look. 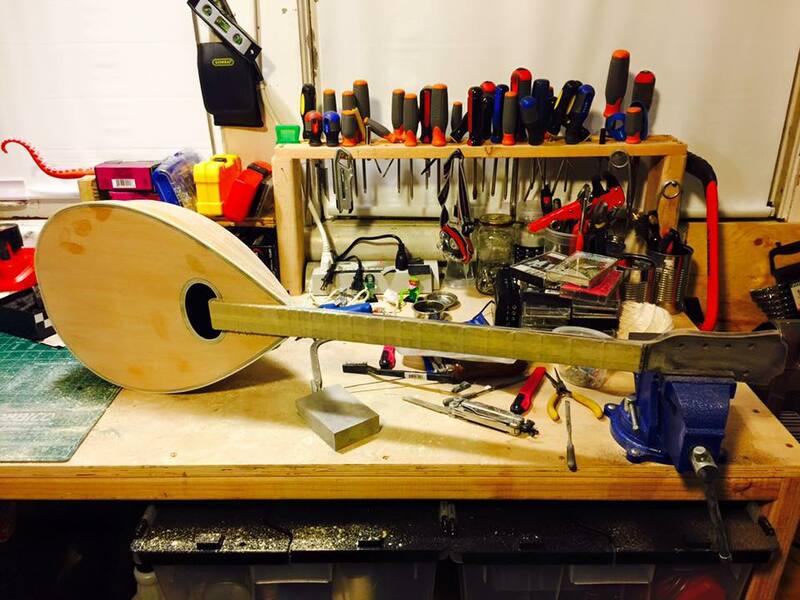 fixing the inlay as well as reshaping the flow of the neck and head. Also so much sanding along with more sanding. With all that completed I gave it a new black enamel coat and let it sit for 3 days to cure. Today started with sanding for another few hours along with creating an all new distressed wash on the front face. From there I went on to burnish the entire piece before hand drawing patterns all over the front face. concluding with hand applied candle wax finish and polishing followed by waxing. The pattern I wanted to keep simplistic and I went for designs I used to draw in my books in high school to really get the angsty goth feel. It ends up blending really well with the sanded enamel wash on the front face. So far it sounds really wonderful and has a really interesting sound, tomorrow I am going to tweak the pickup a bit more and see if I can refine the sound and upload a video.